On the Hard – Spice Island boatyard and Grenada Marine, both on the south side. 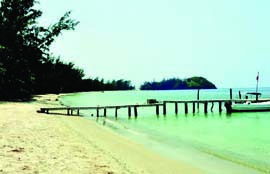 We chose Spice Island for its location and it was clean. This yard was hit hard by Hurricane Ivan so there are a lot of special tie downs and precautions. I consider Ivan an anomaly. Northern Grenada is like stepping back 40 years when the Caribbean was a terrific place – go by car, not boat. Storage – Harbor Village Marina. If we had to do it over again, we would have stored Chewink here for the summer season because it is out of the hurricane area, has good flights, and it is a great island. Harbor – Pick up rental moorings off the town – no anchoring allowed. Restaurants – Plenty, but only one on the water, Richards, is owned by a good friend who stopped there 40 years ago on the way to the Pacific. He has lots of good stories. Diving – Excellent visibility and easy to access. Windsurfing – Great place on the windward side. More interesting than Aruba with the same wind. Lots to do, but not for gringos at this time. What we lost not seeing Venezuela, we made up in Cartagena, a wonderful stop. Colombia is remarkable with its history, beautiful countryside, and great food at very reasonable prices. Anchorage – Off Club Nautico, plenty of room with a few spots that have poor holding. Marinas – Club Nautico which is funky and run down, but is the restaurant and gathering place for everyone. It has been torn down and the re-build has been stopped due to political and family infighting. Club De Pesca is the local club and extremely nice. There are a few transient berths available. Storage – A couple of boatyards with Travelifts; plenty of rumors, but it sounds like there will be more facilities coming – commercial but adequate. Tend to be dirty. Clearing in/out – Two agents, both are good, making the process easy. They used to be at Club Nautico and I expect they still are. Walled city – It takes four hours just to walk these walls that were started in the 1500s; beautiful architecture and general ambience. Restaurants – Plenty of great ones and inexpensive. We came ashore every night for dinner because of the ambience and low prices. The streets come alive after 8 pm. Travel – Left Chewink here for three weeks and toured inland to Medellin and the Amazon (Leiticia). One of our better trips – high mountains, vast Amazon basin (otro mundo), modern cities (Bogota and Medellin) – it has it all. Wind – The Colombian coast has very strong winds during the winter months, with a counter current to make things more interesting. This is a good time to take an extra crew. Cholon Bay is easily the best anchorage in Colombia. Get directions in Cartagena for entering this bay 12 miles south of Cartagena. There is a wind line between the Rosarios and Cholon, making Cholon a great place to rest after Cartagena. Sapzurro is the last town in Colombia before the border with Panama. In the future, we would do the overnight from Cholon arriving early morning in Puerto Obaldia to clear in and get a cruising permit. In quiet weather this is a nice stop – very beautiful walking. Anchor on the left or south side just in behind the little point – we did not use a stern anchor, but others did. This was our fifth visit to the San Blas, but our first to the Eastern and traditional island villages (Kuna Yala). It features wild and woolly sailing with plenty of wind, large seas, and plenty of reefs. However, once in a harbor or protected area, there are wonderful people and very few yachts. The majority of cruisers stay in the western parts of the San Blas like the Hollandes Cays area, leaving the rivers and eastern anchorages to just a few boats. The San Blas is all about hiking and exploring the rivers and is still a world-class cruising area. Anchorages – Plenty of great places. Buy two guidebooks: Zydler’s The Panama Guide and Bauhaus’ The Panama Cruising Guide. They are excellent. The waypoints in Bauhaus are invaluable; directions in Zydler are better researched. Facilities – None except for a few small stores in every village. There are fresh vegetables available, but you have to find them. Transportation – Plenty of airports with cheap flights to Albrook Airport in Panama City make the San Blas a great place to meet friends and guests. Clearing in/out – Puerto Obaldia is a terrible anchorage if windy, but worth going for the cruising permit, as the eastern San Blas is the most interesting. 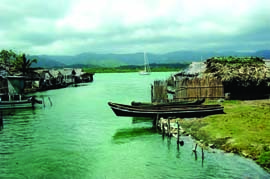 Stop in early morning and leave one person on board; then move 10 miles north to Puerto Perme for the night – a great spot next to a very traditional village. We love Panama because there is so much to do – the highland rainforest in the Boquete area, jungles, rivers, and native villages in the Darien, San Blas on the Caribbean side, Perlas Islands on the Pacific side, world-class fishing, surfing, and diving. Panama City is undergoing a huge change. It is a modern city with much to offer. Facilities –The Panama Canal Yacht Club is now gone, but no great loss as it was run down and put you in the heart of Colon – a place not to be. Shelter Bay Marina – On the northern side of Cristobal Bay is a world-class facility and is the only place available to stop before going through the canal. We (Lyman-Morse) have opened a service satellite there to accommodate the many boats traveling through. Due to the Canal Authority’s control of all the land on either side of the canal, there are virtually no services offered for yachts – the infrastructure has simply not been allowed to develop. Storage – A very secure area with 110-ton Travelift out of the hurricane belt. Travel – Good airplane and bus service almost everywhere. It’s on the way to the Bay Islands from Panama. Knowing very little about this island, it turned out to be a jewel. It reminds us of Bequia in the 1960s. Off the Honduran coast and belonging to Colombia, the inhabitants still speak the same version of Old English the Bequians used to. Facilities – None, a quiet town with a public dock at the public square. Anchorage – Is good with plenty of room; shallows as you move towards the bridge. Services – Not much, as most things have to be flown in. Things to do – Baseball games, horse races, great beaches, plenty of funky restaurants, good hiking and biking, plenty of reefs for diving and snorkeling. Great place to catch up on maintenance and varnish. Comprised of three islands – Roatan, Guanaja and Utila – all have great harbors, excellent diving, and good supplies. Guanaja – The first island you come to from Panama and the most windward – our favorite of the three with an interesting main town (no cars or roads) built on coral to escape the sand flies, and a beautiful windward side accessed through a canal by dinghy. Good place to wait for weather if going east. Roatan – Large with plenty of anchorages. Check out the Garifuna villages and West End. Utila – Another interesting town and the cheapest diving in the world –you get what you pay for here. It’s a good stop on the way to and from Rio Dulce. Charts – Find a copy of the old Caribbean Sailing Yachts (CSY) charts. Most boats have copies of the waypoints for all the harbors. Clearing in/out – Relatively simple in Guanaja; anchor off the northwest corner of town (fuel dock) and go ashore, but the better way is to anchor in Savannah Bight and dinghy over to town. At Roatan, take a taxi from French Harbor or West End to Coxen Hole (the main town with big outdoor market). Sometimes the officials are not at Utila; we cleared out at Coxen Hole before going to Utila. Services – A new large Travelift is now in French Harbor. Plenty of hardware and supplies, but the best shipyard is a beam reach over to La Ceiba where there’s a good Travelift and general yard. Facilities – There are two marinas in French Harbor, Roatan (and several others around the island). Both are excellent places to leave the boat. Moorings are available in West End at times, but there are political pressures to move the yachts out. This is a fun anchorage and many boats do not leave for a whole season. Anchorages – Guanaja has some good choices at Savannah Bight or Graham’s Place. Roatan has many almost fjord-like harbors. French Harbor is the center for the cruisers with West End being where many stay. We like Port Royal. Utila has one harbor off the town. Be careful here, as supposedly some of the restaurants tip off thieves when you are ashore for dinner. This is a truly beautiful river that we never get tired of. We like the Rio as a place to visit and leave the boat. The fresh water and no hurricanes make it a good place for the long term. The living is easy and cheap, so expect an eclectic group of people living on their boats. Texans have discovered the Rio. We left Chewink there three different seasons with great success. Clearing in/out – Arrive in Livingston in the morning to cross the bar into the Rio Dulce before the wind picks up. We have easily seen 6.5 feet of depth just past low water, but the guides all say 6.5 feet at high water. For those with deeper-draft boats, it is fairly common for the water taxis to come out and pull you over (literally) to get over the bar, which is about 300 yards long. We like Livingston, a Garifuna village (descendants of Carib, Arawak and West African people), and it is relatively easy to clear in here with Raoul the agent taking care of everything. Call him on VHF 16 and he will organize everything. There are no roads to anywhere from here; everything has to travel by water. 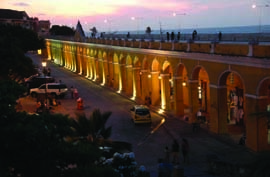 Walls in Cartagena, Colombia are and where the bridge crosses the Rio on the main road. Call Casey at 011-502-5054-6596 or email him at caseybrooks1@gmail.com. He has all the info you need on the Rio. Or access the local website: riodulcechisme.com. Markets – Fronteras is the colorful main town having one long street market. Everything is available – veggies and fruit are plentiful. Go to the orphanage store to buy meats. As usual in this part of the world, pork and chicken are the best bets. Mayan Ruins – This is what Guatemala is all about. Tikal, the biggest Mayan city, is unbelievable and there are many thousands of Mayan sites. Most have not yet been excavated. The Rio is an excellent place to explore many of them, but the pyramids of Tikal have to be seen. They are much more impressive than Machu Picchu or other popular tourist places, and Tikal is a pleasant three-hour drive from Fronteras. Facilities/services – Ram Marine in Fronteras has a 70-ton Travelift with great facilities. There are a surprising number of skilled people offering services in the Rio. Inquire on the local VHF net for help. There is also a Travelift across the river above the town at Able Marine. We stayed at Mar Marine with great success. It’s an easy walk across the bridge to Fronteras. There are several good marinas besides these two; Mario’s, Catamaran, and Tortuga are all good. Mar and Ram marinas have good access to town, with or without dinghy. Restaurants – Plenty of them around in a variety of places. The only travel is by dinghy so most restaurants have a dock. Food is reasonable, but don’t expect culinary delights. Travel – Antigua is 45 minutes from Guatemala City (the second oldest city after Cartagena in this hemisphere). It is a “must-visit” with its 100 language schools and great restaurants. Use Guatemala City for airport connections or the buses, but stay in Antigua if possible. Go to Zone 10 for hotels in the city. “Guat City” has nothing of great interest except the airport. Fronteras is 6 hours from the city and Antigua with plenty of buses or vans to get you there. Fronteras is three hours from Tikal, similar in time from Placencia or Belize City. However, leaving the boat in Fronteras is easier and safer. Lago de Atitlán is one of the many places to visit with traditional Mayan culture and goods. It is a “drop dead” beautiful lake surrounded by volcanoes. Base your boat in Placencia, Stann Creek (airport here), 20 miles from the reef and in reach of many of the better anchorages. It is only a day’s run from the Rio with many places to explore in between. As you go north in Belize it gets shallow. Cay Caulker is worth a visit. 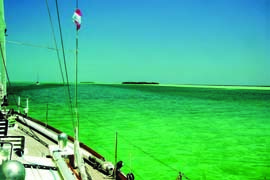 Anchorages – Glovers Reef, Lighthouse Reef, and Turneff Islands atolls are what Belize is all about. The barrier reef off the Belize coast is the second longest after Australia. Keep away from Belize City area as the cruise ships are a huge presence near the city and the nearby reefs. The trickle-down theory definitely does not work here. Services – Not much, but some help can be had in Placencia and Cucumber Bay Marina south of Belize City. It has a 70-ton Travelift. Clearing in/out – Either at San Pedro Town (north of Belize City), or better yet in Big Creek at Placencia. All the offices are next to each other in Big Creek. Take your boat up this deepwater commercial channel and anchor west of the dock. A guard watches your dinghy and a gate protects the port area. Avoid clearing in at Belize City. There are daily fees and up-front charges. Despite all the talk, we found clearing in and out was easy and the fees not onerous. You will be charged when in the park areas, but the wardens are friendly and helpful and keep these areas quite safe. 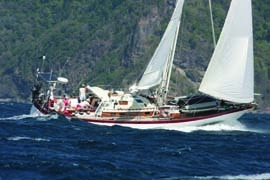 Cabot and Heidi Lyman own Chewink, a Seguin 49 which Cabot built in 1987. They have sailed over 150,000 miles together, including 95,000 miles on Chewink which has one circumnavigation, and then six years in the Pacific based out of New Zealand. Cabot has managed Lyman-Morse Boatbuilding, started in 1978 in Thomaston, ME. Lyman-Morse is a custom boatbuilding yard with a distinguished history. After 35 years overseeing the company, Cabot and Heidi have now taken a backseat to their son Drew. Visit lymanmorse.com. Editor’s note: This article was originally published in the 2013 edition of Voyages, the Cruising Club of America’s (CCA) annual publication, and is reprinted with permission. Special thanks to CCA Commodore Daniel P. Dyer III and Voyages Editors Dale and Doug Bruce. The CCA organizes and runs the biennial Newport Bermuda Race and conducts safety at sea seminars. Their Bonnell Cove Foundation makes grants to non-profit organizations for projects in safety at sea and environmental protection. For more information, visit cruising club.org.